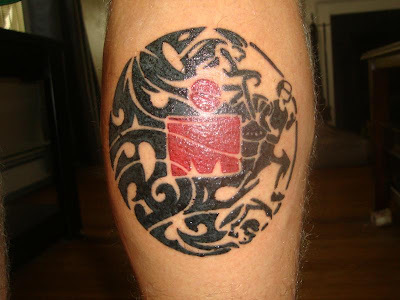 I was just perusing a triathlon forum when I came across a post by someone showing off their latest tattoo with lots of very complementary replies. I was amazed to see that it was the tattoo that I had designed for myself by the awesome artist Steven Barrett but then bottled out of having inked. I feel a bit strange to think that it could have been my leg in the photo below because it does look pretty cool, but also I suppose it would have pissed me off if I had had it done to see that someone else had copied it (actually, the final design had a cap on the runner - I didn't like to be reminded of my encroaching hair loss)... On the other hand, I'm happy that it has gone to a good home, so to speak! At the weekend we went to a park with water slides and I couldn't help noticing just how many people had tattoos. I'm convinced that about two out of every three adults had one, and that was only counting those that were in visible places. There were some striking ones, of course, but mostly they just seemed to be random drawings that were unlikely to have a life changing significance for their bearers; I almost found myself respecting more the old school "Mum" or "Wife's name here" tattoos which at least mean something. I don't want to come across all snooty and elitist - and maybe that's just what I am being - but I have to say, I was quite glad that I wasn't wearing a tattoo myself.